The endocannabinoid system plays a hand in many of the body’s normal functions. The body contains two major endocannabinoids, arachidonoylethanolamide (AEA), nicknamed anandamide from the Sanskrit word for “bliss,” and 2-arachidonoylglycerol (2-AG). CB1 is the receptor in the brain where endocannabinoids influence short-term memory, pain, emotion, hunger and other basic human feelings. When these endocannabinoids are at proper levels, the body is able to function well. When they are out of balance, however, they can affect numerous systems within the body. It is thought that an endocannabinoid deficiency is responsible for many of the hard-to-treat illnesses alleviated by medical marijuana, that are currently increasing in today’s world, and show improvement with the treatment of cannabinoids found in cannabis. The endocannabinoid system is largest neurotransmitter system in the body. In fact, it is larger than all the others put together. The endocannabinoid system is divided into neurotransmitters and receptors. Neurotransmitters carry messages between the body and brain. In order to convey these messages, the neurotransmitter needs to attach to a transmitter that then takes it to where it needs to go. For example, when your stomach is empty, neurotransmitters located in the digestive system lock onto a receptor and travel to the brain. When that specific chemical reaches the brain, the brain releases hunger signals that tell you it is time to eat. This message system is involved in nearly every type metabolic function. 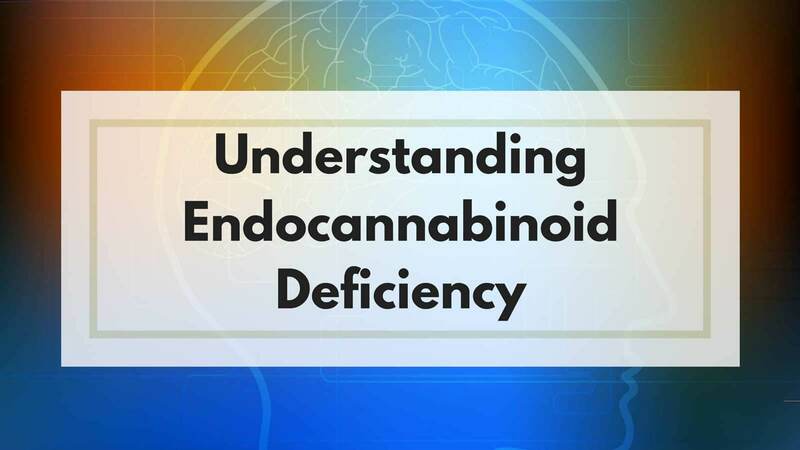 An endocannabinoid deficiency can result in one of two ways. First, the body may not produce enough, or it may produce too much, of the endocannabinoid itself. A second way that things can go wrong is that the receptors fail to bond with the message chemicals and therefore the message does not reach the brain. In either case, the messages become jumbled and the body responds incorrectly. This can result in conditions such as chronic migraines, fibromyalgia, irritable bowel syndrome (IBS) and other chronic conditions that appear to have no easily recognizable cause. Each of these disorders is often co-morbid (or occurring together) and the cause is thought to be an irregularity in the endocannabinoid system. Endocannabinoids, like cannabidiol (CBD), interact with other neurotransmitters such as serotonin. In migraines, studies have shown there is often an excess of serotonin in the brain. Serotonin is found in abundance within red blood cells, where endocannabinoids determine how much is released into the brain. When there is a lack of endocannabinoids, too much serotonin is released into the brain, resulting in migraines. Because the endocannabinoids help regulate pain, and there aren’t enough in the body, pain is increased when the serotonin level exceeds proper limits within the brain. While endocannabinoids, such as tetrahydrocannabinol, and serotonin are also thought to be part of the cause of fibromyalgia, it is, in fact, the lack of enough serotonin that is thought to be the cause. In this case, because the serotonin is not present, the endocannabinoids do not get the message that they need to release to decrease pain. Fibromyalgia results when pain receptors intensify pain to a level that exceeds what it should normally reach. It is thought that the pain perceived by those suffering fibromyalgia is double that of those without the disorder. Yet another connection between serotonin and endocannabinoids is irritable bowel syndrome. With this disorder, the body experiences bloating, diarrhea and abdominal cramps. Serotonin causes the spasms present within the digestive system. Those suffering IBS have been shown to have an increased amount of serotonin, which indicates there is a lack of endocannabinoids to help curb the release of the serotonin. Both serotonin and endocannabinoids are most prevalent in the brain. Both are related to basic reactions such as mood, pain, digestion and stress. Disorders such as fibromyalgia, migraines and IBS show a strong co-morbidity with not only each other but also with emotional issues such as anxiety, depression and bipolar disorder. Until recently, these disorders were mysterious to scientists because they could not figure out what determined the amount of serotonin in the brain. The discovery of endocannabinoids and the subsequent correlation to serotonin levels gives us a look into a possible cure for these mysterious disorders. More research is still needed in order to fully understand the effect an endocannabinoid deficiency can have on the human body, and how to most effectively treat it with the use of medical marijuana and cannabinoids such CBD and THC, but this initial insight promises us hope for the relief of disorders that cause disability in millions of individuals. Medical marijuana has been found to alleviate the symptoms of an endocannabinoid deficiency including conditions like migraines, fibromyalgia and irritable bowel syndrome, if you live in a state with medical marijuana laws, visit MarijuanaDoctors.com to find a marijuana doctor “near me” to discuss whether marijuana is the right medicine for you. What Is the Average Cost of a Marijuana Examination?